SOME HISTORY – Artist David Byrd and Rue Royale Galerie curator Deborah Hicks detail the invention of lithography and its eventual role in movie advertising. Mike Orlando, owner of poster shop Hollywood Canteen, outlines popular uses and sizes for lobby cards (14x11), window cards (14x22), inserts (14x36), half sheets (22x28), and one sheets (27x41). Tal Zimmerman, author Matthew Chojnacki, and Rue Morgue Magazine editor Dave Alexander touch on the movie poster’s growth into collectible commodity. Director Joe Dante and other interviewees discuss the sci-fi poster work of the 1950s through the 1970s from famed illustrators such as Albert Kallis, Reynold Brown, and Bob Peak. Bob Peak’s son Thomas Peak recalls his father removing Robert Duvall’s face from Peak’s “Apocalypse Now” painting at Francis Ford Coppola’s insistence regarding a personal feud. THINGS CHANGE – Colonial Theater programmer Joel Rickenbach, A71 Entertainment’s Chad Maker, and former Anchor Bay marketing director Susan Curran detail how movie studios moved from painted illustrations to digital photo manipulation starting in the 1980s and continuing through the 1990s. Joe Dante dubs the trend “the curse of the star portrait” for its emphasis on prominently featuring actor and actress faces. Along with several artists, current and former creative directors Rob Jones, Mitch Putnam, and Justin Ishmael discuss the birth of Mondo and subsequent boom in alternative movie poster art catering to collectors and enthusiasts. A WIDER WORLD – Following Mondo’s success, similar galleries continued to expand the contemporary movie poster scene. Brock Higgins and Chris Martin of Skuzzles, Jared Dobbs and Mike Gregory of Grey Matter Art, and Adam Martin of Hero Complex talk about their particular studios. SCREEN PRINTING – Wes Winship of BRLSQ briefly demonstrates the process for screen-printing a poster. THE ARTISTS – Artists featured throughout the film include William Stout, Akiko Stehrenberger, Matt Tobin, Todd Slater, Laurent Durieux, Gary Pullin, JC Richard, Justin Erickson and Paige Reynolds of Phantom City Creative, Daniel Danger, Jason Edmiston, Paul Ainsworth, Tom Whalen, Chris Garofalo, Joshua Budich, Robert Bruno, Erin Gallagher, Orlando Arocena, Scott Hopko, Tracie Ching, and Tom Hodge. THE COLLECTORS – Fans talk about their interest in movie posters as a hobby. LICENSING – Pros and cons of working with rights holders and Hollywood studios are discussed. Interviewees lament a popular perception of illustrated posters not playing well to focus groups, but indicate a shift suggesting a return to more traditional movie poster art is currently underway. Presumptuous finger-waggers piping up to jump the gun with an “ahem!” take note, documentarian Kevin Burke is well aware that the standard size of a movie poster one-sheet is 27x41. That’s not the focus of his film. Living up to the fuller breadth of its subtitle and deriving its name from the common 2’x3’ dimensions of current alternative art, “24x36: A Movie About Movie Posters” is a complete chronicle of the medium’s ongoing evolution from studio advertising tool to cottage industry of contemporary collectibles. Pick up your eyes if they rolled out in a glaze while yawning at numerical details above. Although “24x36” runs through a brief “Dragnet” just-the-facts on broad basics of poster sizes and lithography history lessons, the doc is not an OCD nerds-only treatise of tedium about fancy paper. It is, however, very much tuned to the niche appeal of the pop cult poster scene popularized by Mondo, Hero Complex, Gallery 1988, et al. If those are new names with no significance to you, scale expectations accordingly. “24x36” can be an enjoyable indoctrination to the trend for the uninitiated. Just don’t count on it to bowl over casually interested laypeople who may be immune to the movie’s enthusiasm for the art form. “24x36” even dabbles in dollops of Hollywood gossip. If not for a feud with the film’s director, Robert Duvall’s head might be floating alongside Marlon Brando’s and Martin Sheen’s on “Apocalypse Now’s” one-sheet. Bob Peak originally painted it in. Francis Ford Coppola insisted Peak paint it out. How did we go from the gorgeous brushwork of “Raiders of the Lost Ark” to the commonplace template of Photoshopped movie star heads on blue and orange backgrounds? “24x36” connects a concise narrative about poster art that balances a lust for nostalgia with understanding changing business demands and public perceptions. Former Anchor Bay marketing director Susan Curran puts a period on the debate by explaining the need for movie art to be easily digestible in an iPhone format. The intricacies of a Richard Amsel illustration have less of a practical place in this new “blink or you’ll miss it” world of online thumbnail browsing. And focus groups are so conditioned to accept recycled imagery that they can’t see an illustrated poster without presuming it is for an animated movie. For the most part, interviewees graciously accept this reality. Instead of wallowing in melancholy, artists and independent galleries contribute to the peaceful grassroots revolt gradually bringing alternative art back to a front burner. Even in documenting the decline of the poster’s halcyon heyday, “24x36” shows respect for the medium in all forms, remaining optimistic that art will ultimately triumph above all else. Among the movie’s minor drawbacks, there is a slight underrepresentation of notable names. Don’t misunderstand. In addition to postmortem coverage of often-unsung artists such as Albert Kallis and Reynold Brown, “24x36” boasts a big list of essential illustrators driving the current alt art wave. Gary Pullin, Laurent Durieux, Daniel Danger, Tom Whalen, and Phantom City Creative are only a handful of the top talents on hand to weigh in with insight and anecdotes. Yet while there is no doubt director Kevin Burke exhausted every avenue to complete the participant list, I can’t help but be a bit greedy in wanting a celebration of poster art to include words from grandmaster Drew Struzan or modern heavy hitter Tyler Stout, for example. Especially when someone such as Stout features prominently in a segment focused on aftermarket inflation, where his pieces particularly balloon to insane values among collectors. That’s a small chink in otherwise strong armor. The film’s only other dent worth noting is a short span of boredom when the back half rambles woozily through subjects like licensing as almost out of place afterthoughts. “24x36” dispels any notions of perfunctory padding though. The overall presentation is smoothly matted and framed with terrific animations genuinely complementing featured artwork. Burke kicks simplified PBS panning over static imagery to the curb in favor of eye-catching fluidity. Layers on Laurent Durieux’s “The Birds” come together in pieces to highlight detail and moving limbs or rippling waters subtly accent action points in a piece without disrespecting the original concept. 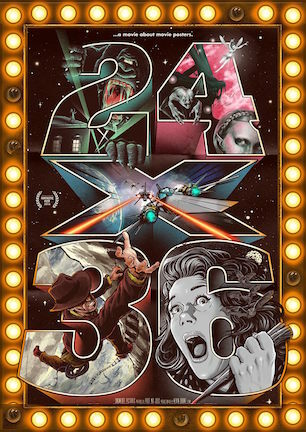 Even know-it-alls already neck deep in poster art as a hobby will come out of “24x36: A Movie about Movie Posters” more knowledgeable as well as entertained. “24x36” is neither stuffy about its seriousness nor flippant in its attitude. A diverse array of intelligent talking heads turns a seemingly simple subject into an absorbing story about how a Hollywood promotional channel continues to be an unexpected outlet for enthusiasts to engage with both filmdom and fellow fans. November 29, 2016 by Ian Sedensky.